Entertaining is not about perfection; it is about connection. If you have followed these musings for any length of time, you know that I love sharing meals with friends. 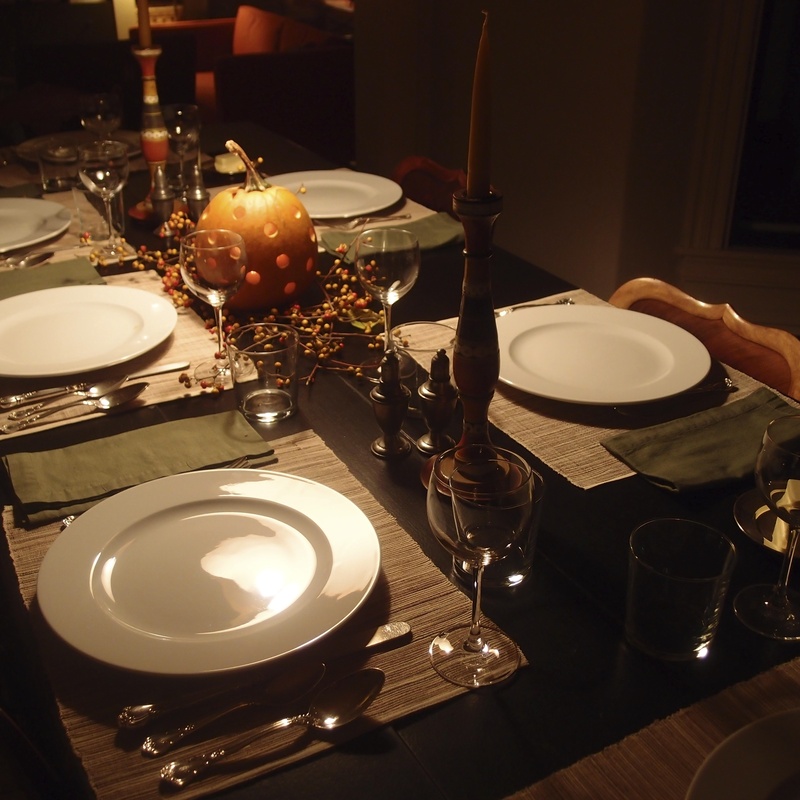 I enjoy the laughter, the camaraderie, the good things to eat and appreciate the effort that friends put into planning and preparing a special evening. This particular friend entertains with artful simplicity. set on a simple black table. The centerpiece is always interesting, understated and creative. 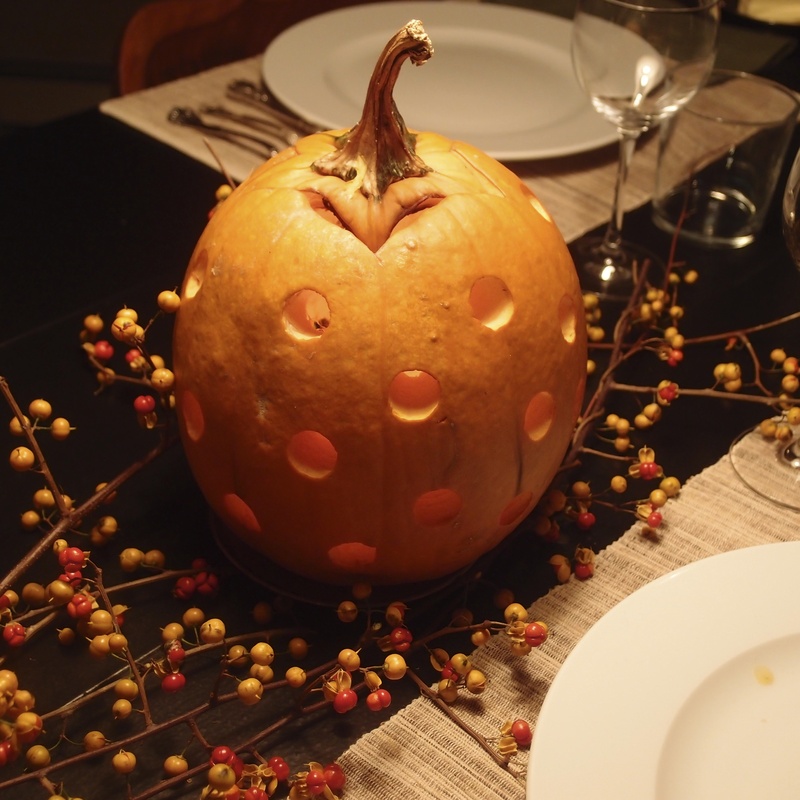 Don’t you love the pumpkin sitting on bittersweet and marvel at the perfection of the carved round holes? The meals here are never disappointing and though they are not likely to be so, they always seem so effortless. This night’s zucchini soup was the best I’ve ever had. 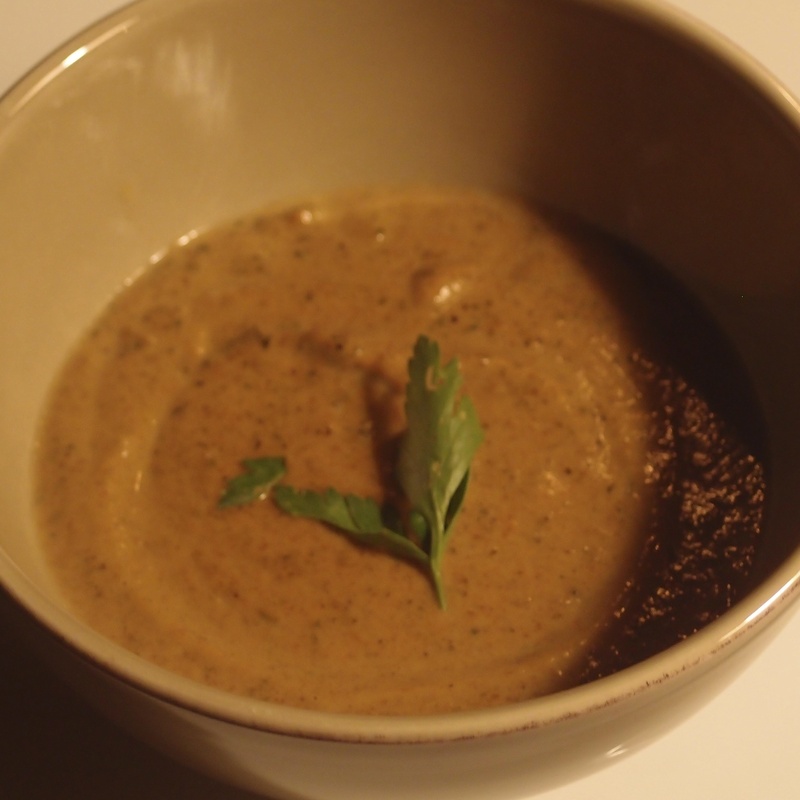 The main ingredients were roasted zucchini, chicken stock and cream blended together in a savory soup. 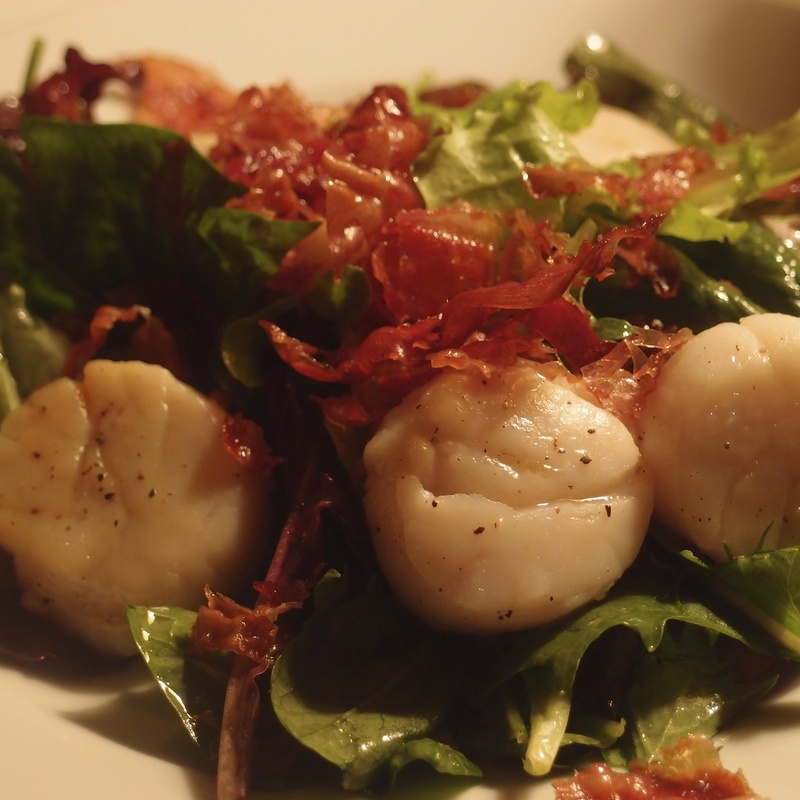 It was followed by seared fresh scallops atop mixed greens and finished with crisp pancetta. The man in the kitchen would surely approve of this! Over an apple crisp dessert, we got to talking about Nutella which I tasted recently for the first time. Where has it been all my life! I was assured there was something even better: Biscoff spread. Once I tasted it I couldn’t stop myself from having one more spoonful, then another and another until I was about to pop. So there you are, a table, a meal, company combined for a perfect evening. I’m fat just looking at it. Oh, well, tonight is chicken night. Another hours on the rowing machine. Do love the holy pumpkins. Sounds fabulous! Have a great weekend. I love simple, and the shiny white plates look clean and chic. I love the polka dot pumpkin sitting on branches of berries. And the food? I do happen to be hungry right now, but the soup and scallops look incredible! Thanks for sharing! Hello there, young Miss! 🙂 I have been super, super slow about getting around to all my favorite blog posts this past week. 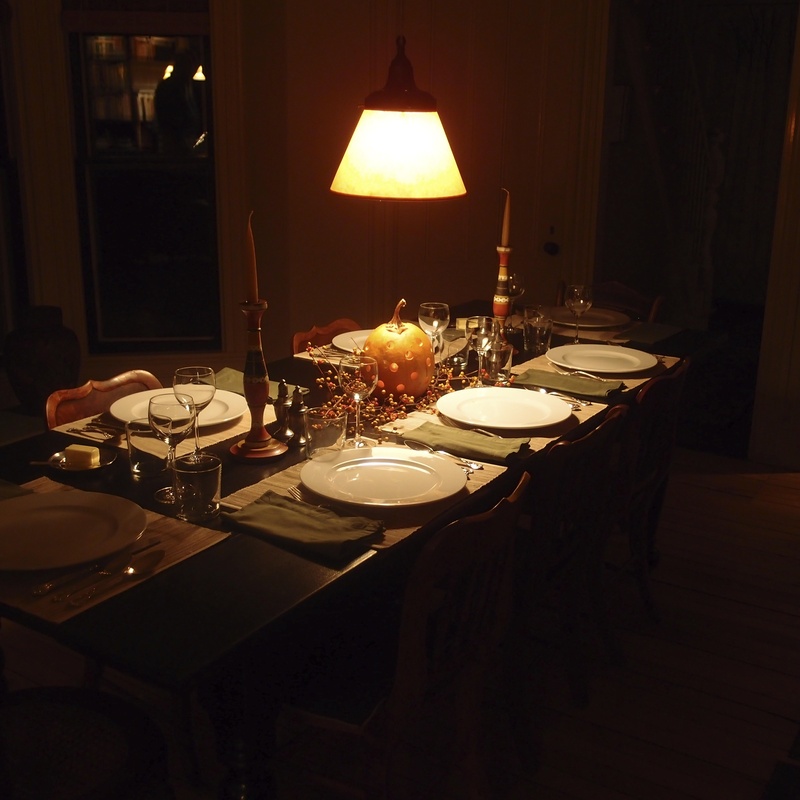 My sister was in town for her birthday weekend, and I hosted a dinner party here for her. That was Friday night, and I’m STILL exhausted!!!!! Just finished cleaning up the last of everything today. I’ve gotten out of practice! 😦 I LOVE THAT PUMPKIN!!!! Did you use one of those hole bore things that goes on the end of a drill? The holes are perfectly spaced! The bittersweet around it makes it look like a still life. I can just imagine people sitting around this table talking quietly and enjoying the serenity. It’s beautiful! I have never had zucchini soup. Is it kind of like squash soup or does it have a distinctive flavor all its own? I’ve had zucchini bread, and I liked it a lot. Hmmmmm….may have to make that this week. Thanks for the inspiration! 🙂 Take care, and enjoy your Monday! I take no credit for the pumpkin. 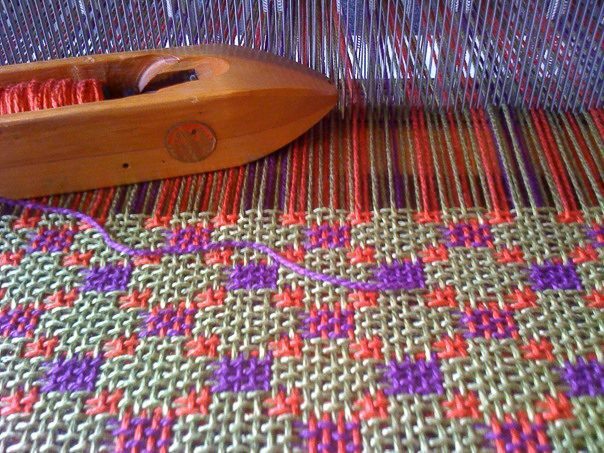 That was the work of a friend whose table it adorns. I loved it, too. Her zucchini soup was incredible, I think because the squash was roasted. Glad you had a fun time with your sister. I thought I was already a follower. I don’t know how to tell. I’m so backwards! I’m checking the “notify” box now just in case I didn’t do this already. 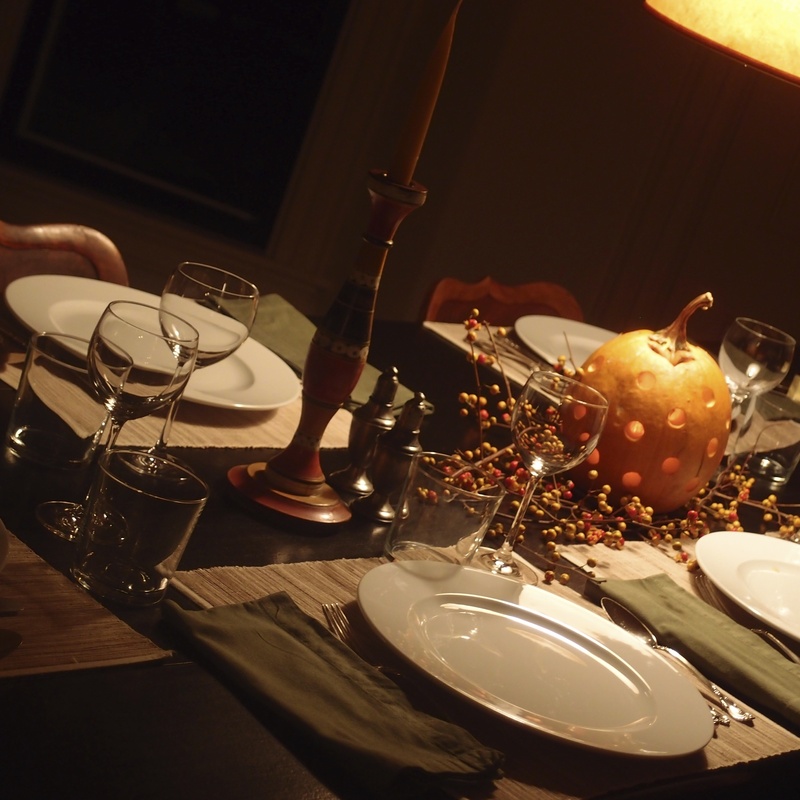 I love simple table…I really like that pumpkin, so much prettier than a scary faced one! I love your dinners with friends, I always feel as if I have been there! Thanks so much for sharing these occasions.